Considering the amount of artistic goodwill that Ricky Gervais has built up over the years here in America, news that his new film "Cemetery Junction" won't be getting a theatrical release here is both shocking and dispiriting. Word that "Junction" will be going straight to DVD on Aug. 17 comes from DVD Activeby way of The Playlist, who gave the film a so-so review earlier this year. While the general consensus is that the film is less than great, one would think that a film from the genius behind "The Office," "Extras" and "The Ricky Gervais Show" would at least merit a chance. The film, which Gervais co-wrote and co-directed with longtime collaborator Stephen Merchant, stars Ralph Fiennes, Emily Watson, Matthew Goode and a slew of unknowns, in a story about three young men trapped in a small town in 1970s England. 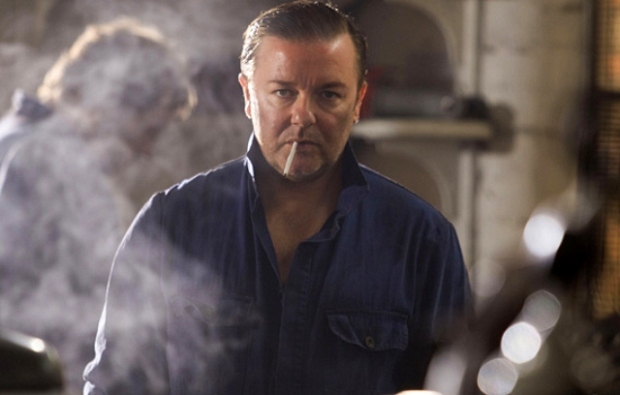 Gervais has described the film as his "Saturday Night Fever." While it's true that Gervais' films "Ghost Town" and "The Invention of Lying" have not done terribly well at the box office, it nonetheless comes as a surprise that "Junction" couldn't even get a "platform release" (PR speak for opening in LA/NY to see if it can get any traction), especially when you consider some of the garbage that shows in 3,000 theaters. Next Stop, Ricky Gervais' "Cemetery Junction"
We don't pretend to understand how these people think.